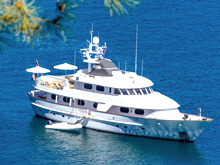 According to French tax guidelines dated 25 June 2013, contracts relating to yacht charters commencing in French waters for the purposes of leisure travel and signed from 15 July 2013 are subject to VAT as per the rules defined for pleasure vessels. In compliance with the ECJ Bacino ruling, the exemption no longer applies to hiring and charter operations for leisure use, either with or without a professional crew, including operating on the high seas. The applicable VAT rate is 19,60 %, however the taxable base can be reduced by 50 % where the yacht is also used outside EU or French waters. Consequently yacht owning companies established outside Europe need to appoint a tax representative who will perform the formalities related to VAT registration in France, the submission of tax returns and making of VAT payments. The other yacht owning companies may also appoint a tax agent who will perform the same VAT formalities. La Représentation Fiscale, the first ever tax representation company in France has created Yacht Tax Services, a dedicated French tax representation company providing services to yacht owning companies incorporated outside France.